Java Moss on Half Coconut with 3 Holes. An attractive idea and very popular with Shrimp keepers or bottom dweller keepers. No need to soak first as it will sink straight away providing an instant, attractive, lovely looking moss. The moss is a slow grower and will need trimming occasionally with some scissors. Coconut varies in size from 10-15cm in length. A great addition to the aquarium, and a great hide out! Looks fantastic in the aquarium and my loaches love it. Highly recommended. Wonderful full coverage of verdant moss. Looks completely established with no gaps. Shrimps moved in straight away! 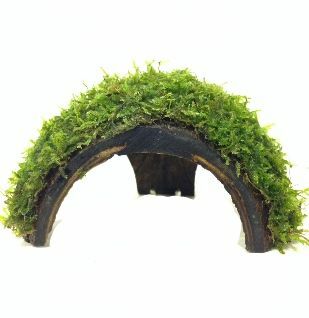 Fab quality moss, rides out the full cycling process, and grows well. My fish and shrimp love it as both a forage zone and a hide away. Amazing! Really lovely healthy moss nicely presented and looks fantastic in the aquarium! I'm delighted!